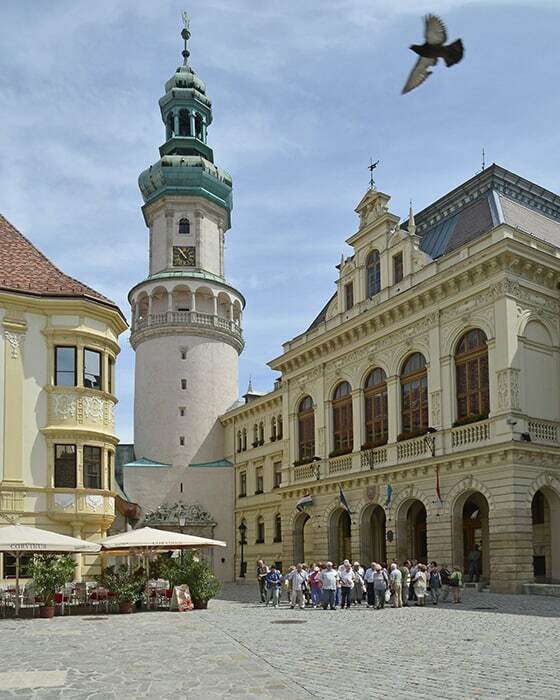 The symbol of the city of Sopron is the Firewatch Tower. Its cylindrical lower part was built on the remains of the Roman town wall, and served as the north tower of the city from the 13th century onwards. helm roof after the great fire of 1676. The tower guards fulfilled a most important role: watching the area, they indicated the position of the fire with lanterns at night and colourful flags in the daytime. wine coaches approaching the town. They showed their musical talent as well, providing music at weddings, funerals, and town festivals, based on contracts with the city council. They drew the attention of the people to the passing of time by sounding their trumpets from the balcony every quarter of an hour, and from the 16th centurythey also handled the tower clock. The double-headed eagle was a gift from King Ferdinánd II and Queen Eleonóra for the parliamentarysession and queen’s coronation, both held in Sopron in1622. great fire, on Emperor Lipót’s nameday. The foundations of the tower were damaged during the demolition of the old City Hall in 1893.
on the plans of Frigyes Schulek. After climbing nearly 200 spiral stairs, a splendid view of the monument town can be enjoyed from the balcony of the tower – the former post of the guards.